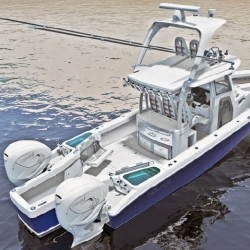 Edgewater, FL, March 18, 2019 --(PR.com)-- SŌLACE Boats announces today the launch of its first model in a new boat line which will include a variety of lengths. The SŌLACE line will not be limited to offshore. The 345, which is poised to revolutionize boat design is manufactured in Edgewater, Florida at a state of the art facility on 16 acres. Providing family-friendly, fishing and diving prowess, the 345 stands at the crossroads of luxury and adventure. The leaps in design found within the 345 are defined by numerous associated patents. Notably, the dual motors are placed outboard of the centerline. This allows a 5’ flush access that sweeps though to a dive door and hydraulically-extending swim platform. To either side are two-person folding benches, across from a three-person retractable bench that extends from the workstation. Forward seating and storage innovations balance the entertainment space, while an optional second station with folding buggy top add to the already immense capability. The SŌLACE 345 is currently in production with rapid precision. Key industry partners aligned with Stephen’s vision have been instrumental in the build, and the resulting masterpiece. Dealer inquiries have been steadily growing, with a global network coming into focus. Next-generation introductions such as the 345 make for an exciting time in the industry, a time that SŌLACE is proud to lead. Units are expected to be available for sale in June 2019. Further details on features and pricing to follow in the coming weeks.